Gov. 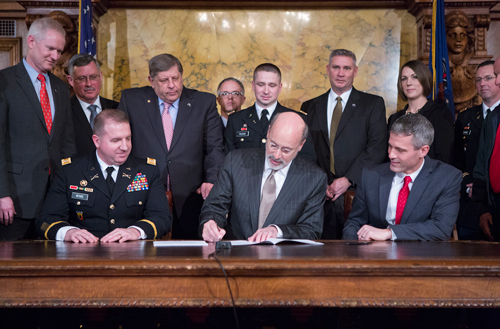 Tom Wolf today signed legislation into law authored by Rep. Rob Kauffman (R-Franklin) that will exempt active duty military pay from the local Earned Income Tax. HARRISBURG – Working to help Pennsylvania’s military men and women, Rep. Rob Kauffman (R-Franklin) today witnessed his legislation exempting active military personnel from having to pay a local Earned Income Tax (EIT) get signed into law. Kauffman said active duty military pay used to be exempt from the EIT, but was inadvertently changed under a new law in 2008 that altered the definition of “earned income” and resulted in the EIT being taken out of active duty military pay earned within the Commonwealth. The new law will take effect immediately and is applicable to earned income taxes levied and collected after Dec. 31, 2015.